Continuing our recent trip to the Northern Kruger we came across a small group of Tsessebe (Damaliscus lunatus) antelope. 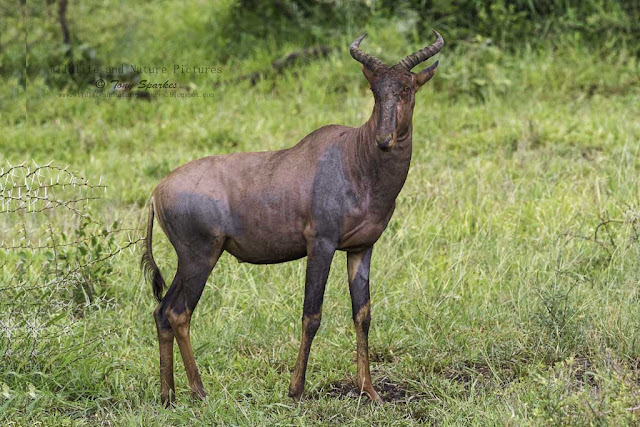 Primarily found in the South of sub Saharan Africa, Tsessebe used to be far ranging. A speedy antelope which can attain speeds of up to 80km/h. Quite large and social antelopes with adult Tsessebe reaching up to 230cm in height and weighting in at about 140kg. Female Tsessebe antelope are usually found in groups of upto to 10-12 animals with their young, while males are ejected from the herd after a year or so and can form bachelor herds of up to about 30 animals. Their bodies are chestnut brown. The fronts of their faces and their tail tufts are black; the forelimbs and thigh are greyish or bluish-black. Their hind limbs are brownish-yellow to yellow and their bellies are white.